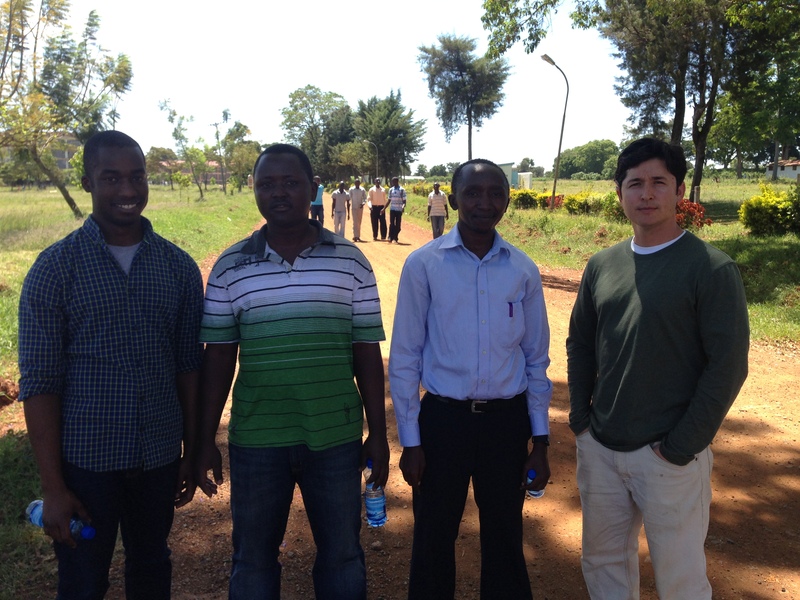 One of our first interactions with community leaders came after a church service led by Fr. Chris, when we enjoyed a meal together, sharing our backgrounds and dreaming about the potential of our partnership. That meeting lasted almost four hours and we left energized to begin our work. 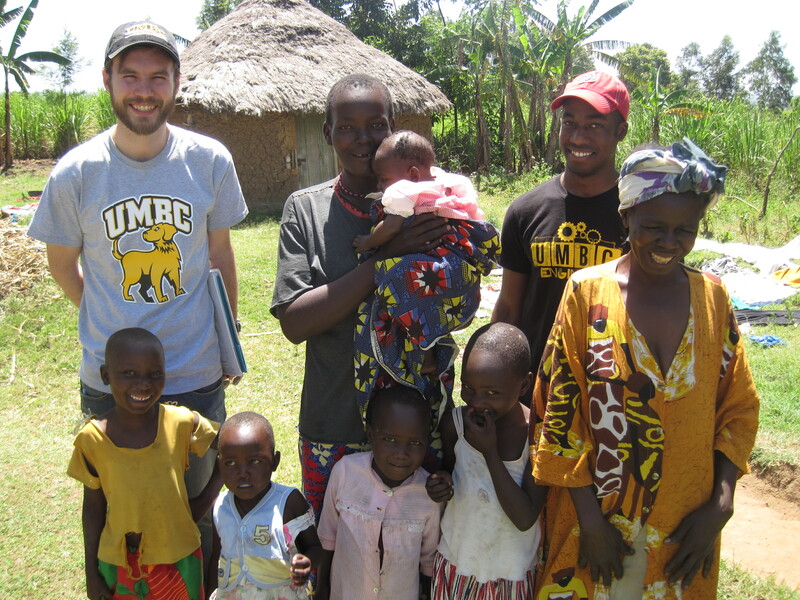 Dr. Blaney and Dalton Hughes with Evelyn Ayuma and her family. 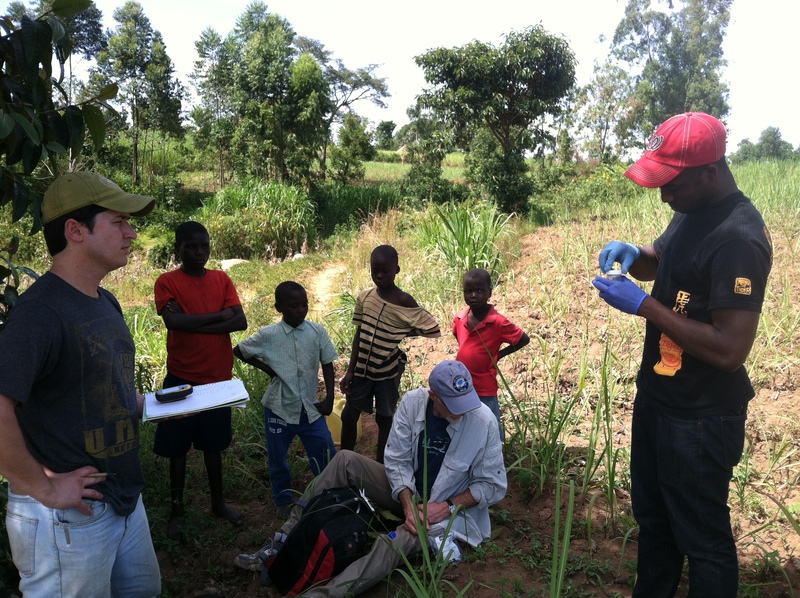 The next day we visited the water source to determine the chemical and bacteriological quality of the water. Testing revealed elevated levels of nutrients, presumably from fertilizers, and high counts of microorganisms like Escherichia coli, total coliforms and Enterobacteria, suggesting that the water is not safe for consumption. Additionally, our discussions with Isongo residents revealed a need for improved sanitation infrastructure and access to hygiene information, goals we’ve since folded into the project. Villagers wash their laundry downstream from the water source. 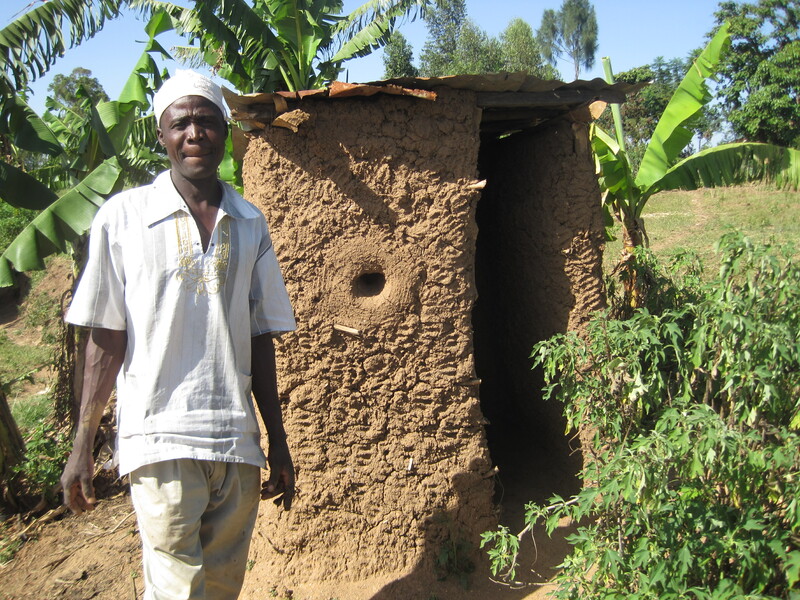 Isongo resident Idi Kisikuka and his latrine. Toward the end of the trip, we visited Masinde Muliro University of Science and Technology (MMUST) in Kakamega to discuss ideas for ongoing collaboration. The result: MMUST students will act as an on-the-ground team, continuing to collect data for the project between EWB-UMBC visits. UMBC students Dalton Hughes and Chris Mullen with MMUST students. Discussions with community leaders have yielded two possible solutions to the water safety problem, which we are exploring further as we gear up for an implementation trip in January 2014. We welcome interested readers to donate to the project online or to visit the EWB-UMBC website for updates. Asante sana (thank you very much)! 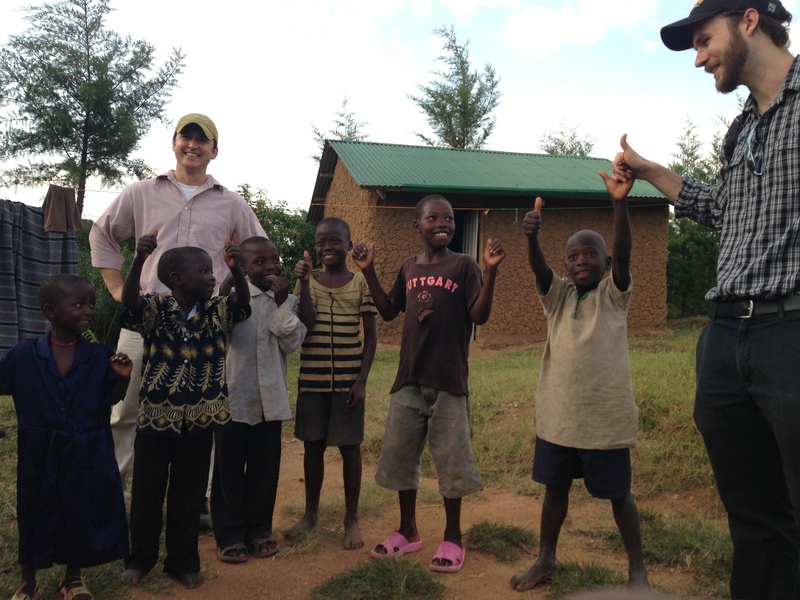 Chris Mullen, Dr. Blaney, and some Isongo children deem the assessment trip a success. 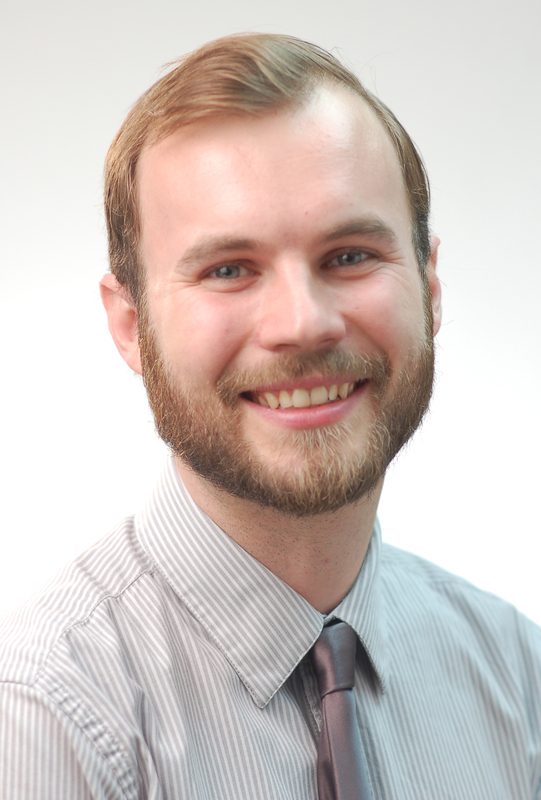 Contact the author, Lee Blaney, at blaney@umbc.edu. This story peaked my interests to raise the possibility of colboration with the United States Military who already has mobile watar filtration systems and waste sanitation systems. Have considered commuicating with leaders in decision making capacity from the United States Defense Department or the Secretary of State for assistance with logistics in locating equipment which may be available for donation or reduced cost? Dalton Hughes is the man! !